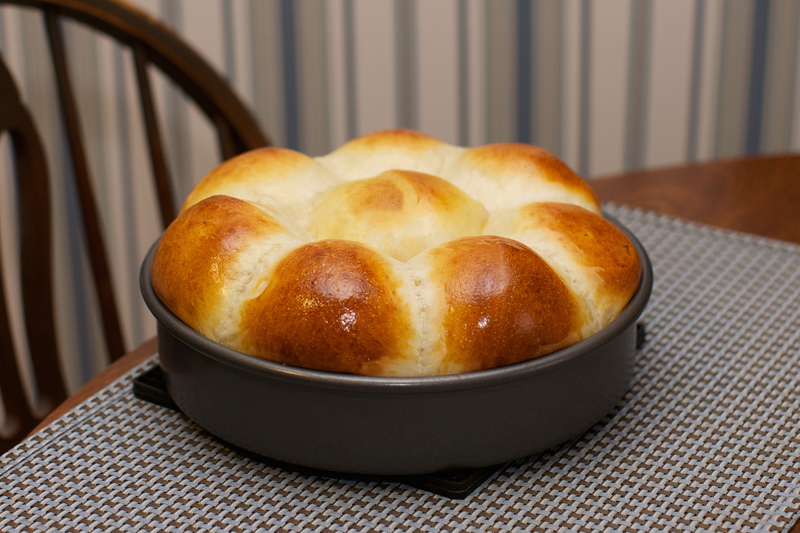 These are yummy butter-rich dinner rolls. Super easy and a great recipe. I also use this very same dough recipe for my cinnamon rolls. It can also be made in a bread machine on the dough setting. Using dough hook on mixer, knead for 5-7 minutes until elastic and not sticking to the edges of the bowl. Place dough in a bowl and let rise in a warm place (covered) for at least 1 hour until doubled in size. Put dough on a lightly floured table or board and divide into equal parts. Shape each piece into a round ball (tucking dough under until you get a nice round shape) Place in a lightly greased pan. I used a 9 inch non-stick cake pan. Cover and let rise 1 hour. When ready to bake brush with an egg wash (1 egg yolk and 1 teaspoon water) You can also sprinkle with sesame seeds after the egg wash. Bake at 375 for about 15 minutes until golden. This recipe makes 8-10 super large rolls or you can double the amount and make smaller dinner rolls. This entry was posted in Uncategorized and tagged butter rolls, dinner rolls, rolls. Bookmark the permalink. Send them on over, we need some rolls for dinner. They look perfect, I can almost smell them. Thanks Susan, a little at a time. Can’t eat too many naughty things anymore.